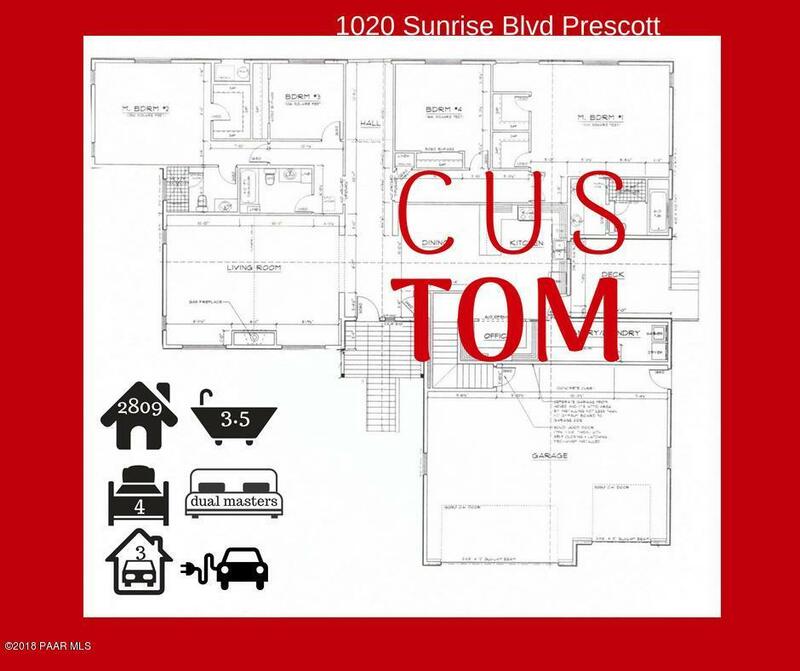 4 bedroom 3.5 bath 2809 Sq Ft CUSTOM HOME designed to take advantage of the gorgeous views from Yavapai Hills subdivision in Prescott with all city services and low HOA. Asking price $20,000 under appraised value. Minutes to Downtown, shopping and first class medical facilities. Come enjoy the wonderful Prescott Lifestyle from this spectacular location. Your Home will be built using Anderson Windows Synthetic Colored Stucco System with 2x6 completely sheered 8in walls Gas & Wood Combination Fire Place 8ft Doors with Rustic Front Door Wood look Garage Doors Composite Decking and Stairs Wood Look Tile or Hardwood floors Lenox gas pack AC & Heat Stainless Steel appliance package Hand Made Custom Cabinets and MOREGranite Countertops - Brush Nickel or Bronze Hardware package - Vaulted Beam Ceilings- Large 3-Car Garage with 30amp service for Electric Car - Standard Features on the 2809 model include: Work Shop with Rest Room, Office, Dual Master Bedrooms, Outside Dining Patio, and Large Laundry Room. Available: Level Walkway around home, NOTE: CURRENT PRICING REFLECTS APPRAISED VALUE BEFORE CONSTRUCTION. PRICING SUBJECT TO CHANGE BASED ON UPGRADES. Call Sheri to make appointment to meet with builder/designer and CHOOSE YOUR OPTIONS! Listing provided courtesy of Sharon Lopez of My Home Group Real Estate.